When it comes to flying insects, few are more annoying and painful to deal with than wasps. They’re aggressive. They fly. They often build nests and multiply. And, most painfully, they sting. As a Houston pest control specialist, we sometimes get the question of what the best thing to do is if you’ve been stung by a wasp. While we’re not equipped to deal with true medical emergencies, like an allergic reaction, there are some helpful things to know if you or someone else find themselves stung. 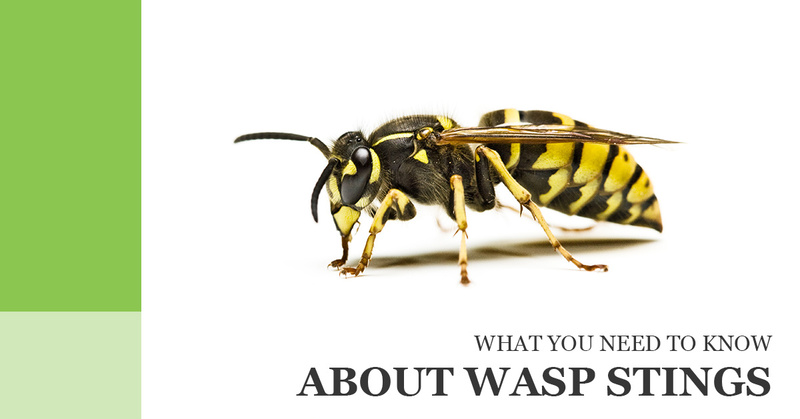 So we put together this short little guide on wasp stings we trust you’ll find helpful. What are the Symptoms of a Wasp Sting? One “good” thing about a wasp sting is usually they usually produce minor, local effects on their victims. These effects include a welt in the area in which the sting occured, followed by itchiness, continued swelling, and redness. If you are allergic to wasp stings, the reaction can be larger and swelling can increase for two to three days after the sting. You may also experience some nausea and even vomiting. However, in the worst case scenario, a victim can suffer from anaphylactic shock. This is a severe reaction which can put your life in danger. This type of reaction often occurs within a few minutes or even seconds from the initial sting. However, in some cases reactions might be delayed by half an hour or longer, so it’s important to stay vigilant even after some time has passed. For most stings home remedies will provide adequate relief until the symptoms subside. If the stinger is still in the skin, make sure to remove it. After that, you may want to apply ice to the affected area, apply hydrocortisone cream, or take an antihistamine. Most wasp stings don’t require any medical attention. In the case of anaphylactic shock, the best thing to do is call 911 immediately or rush the victim to an emergency room. If you or someone in your household has a history of anaphylactic shock, you should have an EpiPen on hand to administer immediately after the sting. How do I Stop Wasp Stings Before They Happen? The best (and least painful) way to deal with a wasp or bee sting is to prevent them. We got into this business to help protect people from pests, and there’s nothing we’d rather do than help you and your family out before wasp or bee stings become a constant problem. This is especially true if you or anyone else in your household has a history of anaphylaxis. So if you’ve got a wasp or bee problem, especially if you need nest removal, please contact us today. With over 25 years of experience, there’s nowhere you’d rather turn than Wildlife X Team Houston to help you deal with your wasp problem.